Click on picture for larger view! 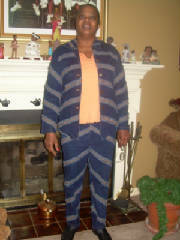 Black w/contrasting black w/white pin stripes Denim Jacket and Pant Suit. 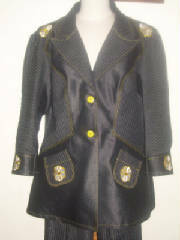 Jacket has black pin stripes pockets w/white and yellow gold flower embroidery. 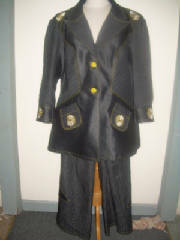 Front and back shoulders also have white and yellow gold flower embroidery as well as sleeves and pant legs. 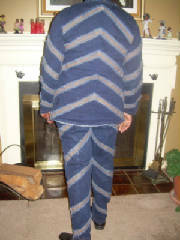 Pants are black w/white pin stripes stretch denim. 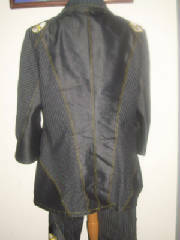 Jacket is topstitched w/yellow gold thread. Please be sure of measurements before ordering!! Please use body measurement chart above when ordering! 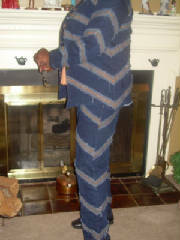 Blue and ivory striped denim jean jacket and pants suit. 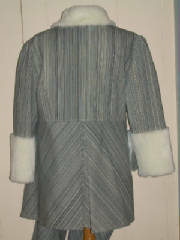 Jacket has ivory/off white fake fur on collar, open sleeve cuffs, and jacket pockets. 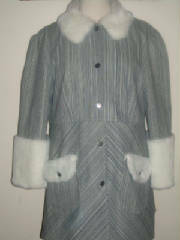 Jacket has silver buttons on front and a pleat in the back. 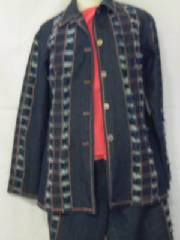 Three piece denim/jean pant set include below hip jacket, blouse and pants. 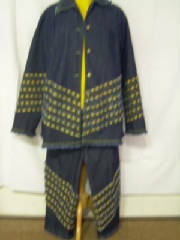 I've taken denim and embellished it with grossgrain ribbon beaded thru out set to give it a unique look. (ribbon color is your choice). 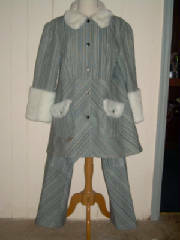 The top will match your choice of ribbon color. 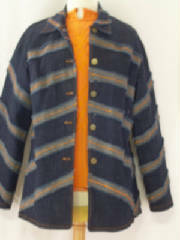 Three piece denim/jean pant set include below hip jacket, blouse and pants. 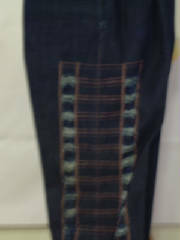 I've taken denim and embellished it with zig-zag top stitching (thread color is your choice). 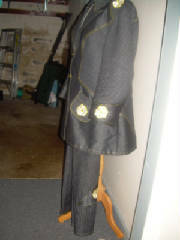 aI then frayed down the side of pants, front & back of jacket as well as down the sleeves. 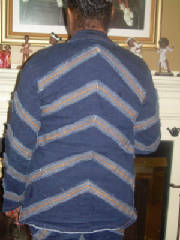 The top will match your choice of thread color. 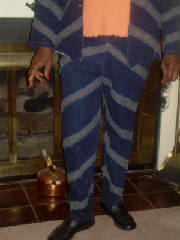 Three piece denim/jean pant set include below hip jacket, blouse and pants. 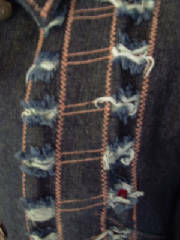 I've taken denim and embellished it with reversed strips of denim, zig-zag top stitched w/orange thread (thread color is your choice) and then I frayed the edges of the strips to give it that unique look. The top will match your choice of thread color.